Lots of photo enthusiasts around the world seem to be waiting for the new Canon EOS 6D Mark II. This is the new brand of Canon DSLR which apparently will be shipped soon this August 2017.There are so many predictions and rumors appear in this circle and starting to reveal their information, especially on Canon EOS 6D Mark II Price and release date. So, let’s find out the specification of Canon 6D Mark II as explained below. Long waiting has ended after finally, Canon India revealed their 2 new Canon DSLR cameras: Canon 6D Mark II and Canon EOS 200D. Both cameras were introduced on July in an event held by Canon India. Although many eyes are stick in EOS 200D, but now we’re going to talk about the 6D Mark II first. This is an entry level camera which is said to have “not so-entry” specification. And more interestingly, as an entry level we can expect that Canon 6D Mark II Price is affordable. So, what can this “affordable price” gives in new edition of Canon EOS 6D? Here’s the answer. Canon 6D Mark II price is worth an all-black nuance body with magnesium alloy as the main material. Having this material, this camera will feel very nice in your hand even for daily handling. For the size, it is packed in 144 x 110.5 x 74.8 mm body dimension. For the weight, this camera weights 765 grams with battery and card inside, and 685 grams for body only. This is an average weight of DSLR, which should not be a problem for the handling. Further, The 6D Mark II also has sophisticated lens on the front body. The shutter button is on reachable spot on top-plate along with mode dials. Eye-level SLR with fixed pentaprism viewfinder is also available. For easier view, it has 21mm eyepoint with approximately 0.71x/33.3° magnification. Users also able to use 100% coverage viewfinder to get precise image composition without spending too-much battery power. On the rear side, the LCD Screen dominates the rear body along with some navigation menus. For the screen, manufacturer adds 3” Vary-Angle LCD with touch screen panel. With liquid-crystal monitor technology, this feature will give unforgettable experience of camera control and review. And also, don’t forget that this camera is water and dust resistance. As an entry level DSLR with affordable Canon 6D Mark II price, the specification of this camera is quite bold. Deeper under the surface, you will find 35.9mm x 24.0mm full frame sensor with 26 26.2 Megapixel resolution. Adopting DPAF CMOS Sensor technology, the taken image will have higher density than before. On image processor, the manufacturer seems to set DIGIC 7 for perfect and natural color tone transition. The 6D Mark II will be able to record 1080P 60p. So, it is going to be good camera for videography. Aside from that, it is also possible for users to record Time Lapse Movie in high stability and smart focus. This cool camera offers Dedicated Phase AF Module and Hybrid Sensor. With up to 45 AF points, you can freely change the focus point easily and more accurately. Clearly, this is the AF system you have never seen on previous Canon Mark. In this digital photography era, connectivity is one of the main factors of interest. For this reason, Canon has applied advance connectivity in Canon 6D Mark II. For file transferring, is has advance NFC, BT V.4.1, and Wi-Fi IEEE 802.11b/g/n. Having these features, it is going to be easy for real-time file transferring and uploading. Last but not least, this Canon series is informed to pack with powerful BG-E21 battery for longer journey. With all these features, Canon EOS 6D Mark II price should be something worth spending. That’s all about this camera specification. 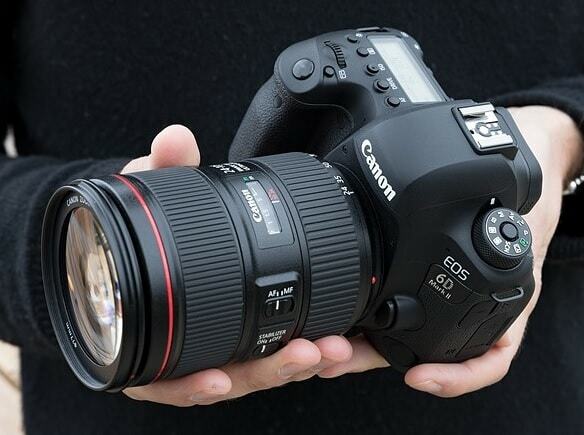 Overall, this is a promising DSLR from Canon which is already equipped with recent technology. The new sensor, image processor, AF module, better video, and vary-angle LCD are epic. The phase AF module will be meaningful for you too; moreover it is supported by DPAF sensor in your hand. So, if you are looking for an affordable camera with rich features, this one will definitely perfect. As for the price, Canon USA site reveals that Canon EOS 6D Mark II Price is 1999 USD for body only. And even though it has been introduced on July 2017, but Canon 6D Mark II is planned to start shipping on August 2017. Previous post Nikon D3500 Specs: Will It Rock Entry level Camera Market Harder than D3300?